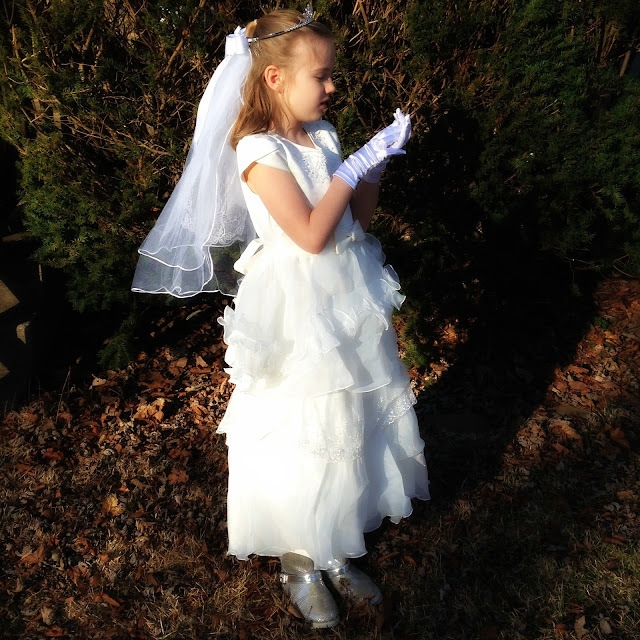 If you've been reading this blog for long you may recall that Sadie has been anxiously waiting for her first communion for a very, very long time now. More than half of her life now. For those who haven't been reading for so long I'll give you a quick recap. 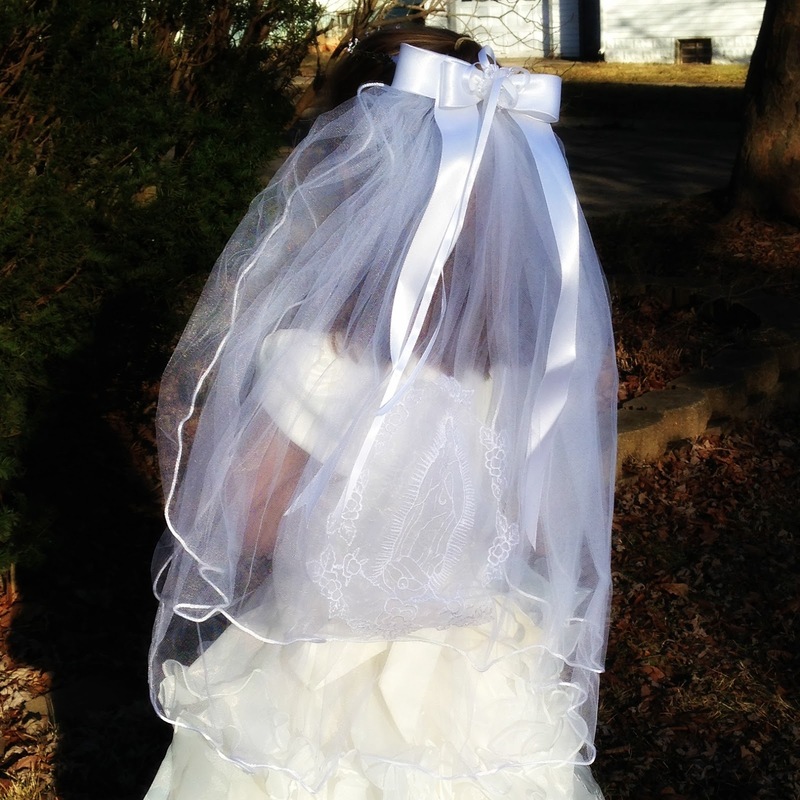 Sadie desperately began trying to receive when she was three. 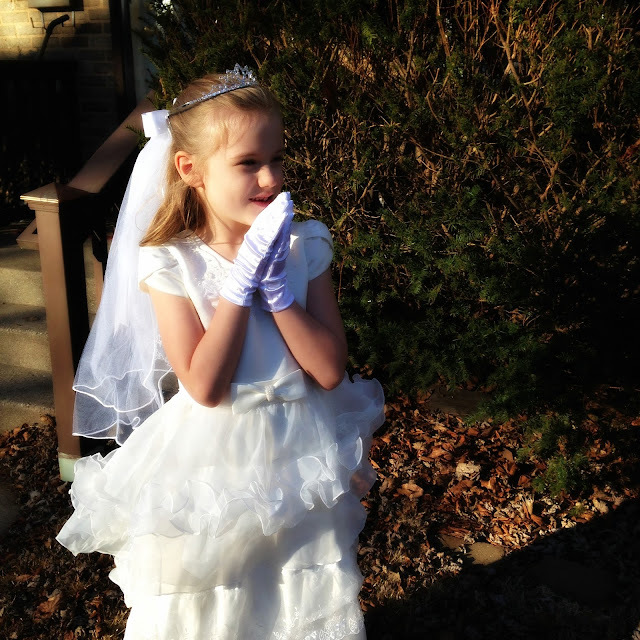 She'd file forward at communion with us, and clasp her hands in front of her and kneel beside me and extend her tongue and look hopefully at the priest. She was especially hopeful when we were traveling and weren't at a parish where the priest recognized her. 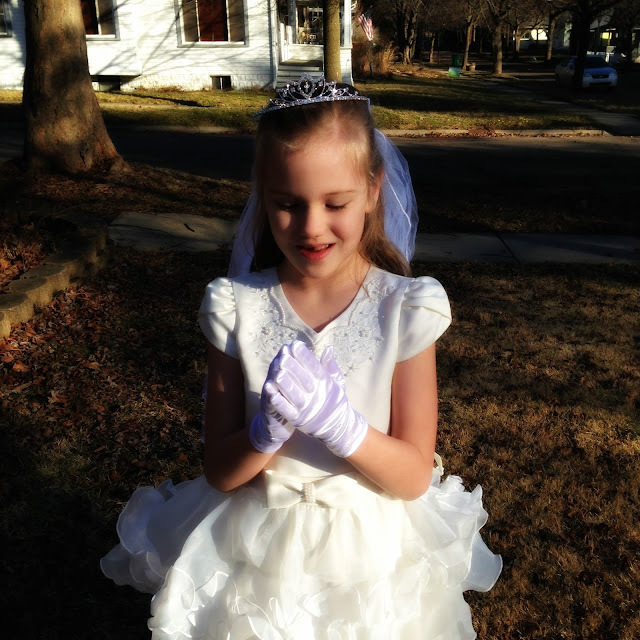 Many times I put my hand in front of that hopeful little mouth and shook my head no to indicate that our very tall her girl had not already had her first communion. When she was still a preschooler I explained that when it was time for her first communion it would be a very special day and she'd get to wear a white dress and a veil. 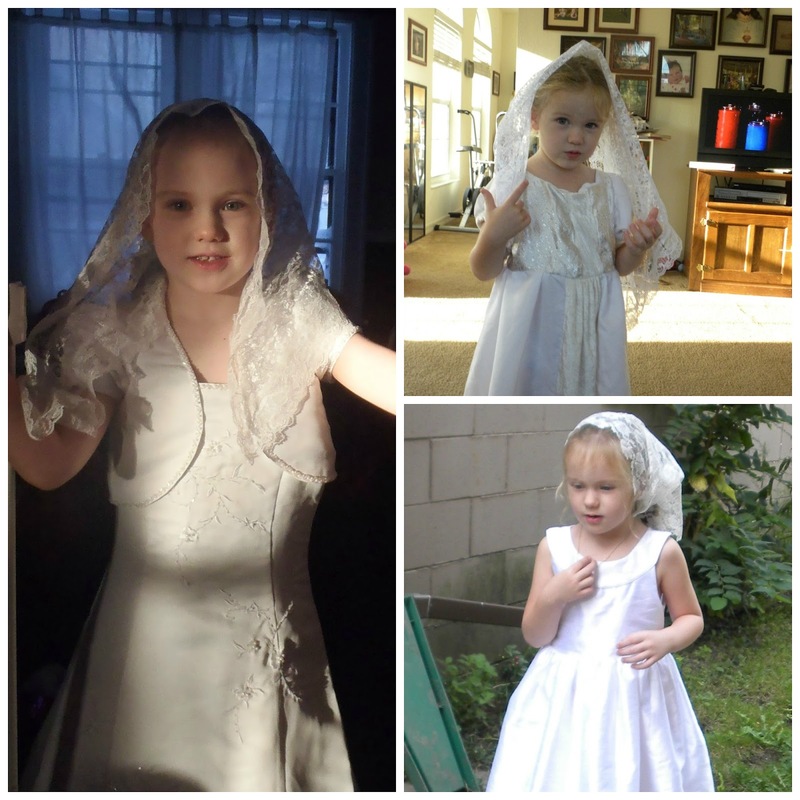 Three year old Sadie immediately began requesting white dresses and asking to wear one of my white veils to Mass. Sometime before she turned five she began to understand that she really was going to have to wait. She's seven now and the waiting is nearly through. She surprises me every week in religion class when she correctly answers questions that I'm almost certain we've never talked about. Religion class is at home. We were actually planning on having her take our parish's class to meet more children at our parish, but the class is only offered online now, and is even the same program we used for the religion portion of her school classes, so nothing has changed this year (although there is a Little Flower's program, which she loves, that's giving her the opportunity to meet kids from our parish). And she is ready... so ready! 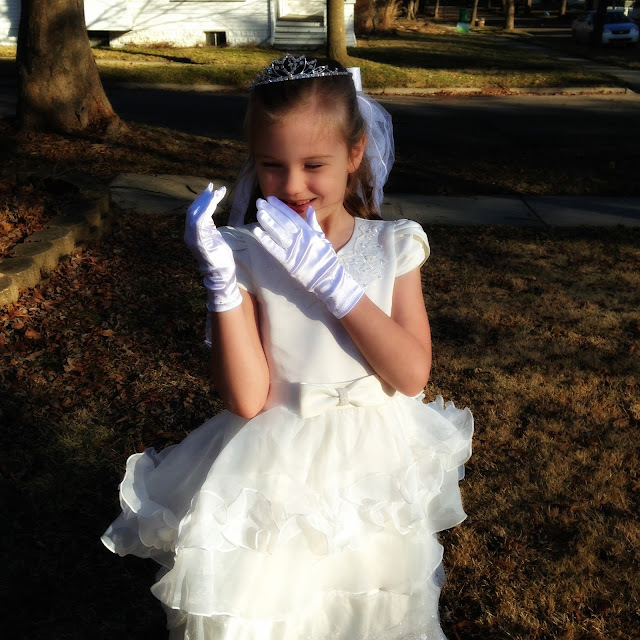 Her First Communion is still a few months off, but yesterday her dress and veil and tights arrived. We'd ordered them from Zulily (that is an affiliate link) and while we've never had a bad experience while ordering from them, I was still pleasantly surprised by the quality of the dress, which is amazing and beautiful and of a quality that reminds me more of wedding dresses than any child's dress I've seen before. Here are a few pictures, in our newly snow free front yard, that I snapped this morning. And as I scroll through these I can't help but ask where the last four years have gone! Because this feels like it was only about five minutes ago! It's so lovely to see young people excited for their First Commmunion! 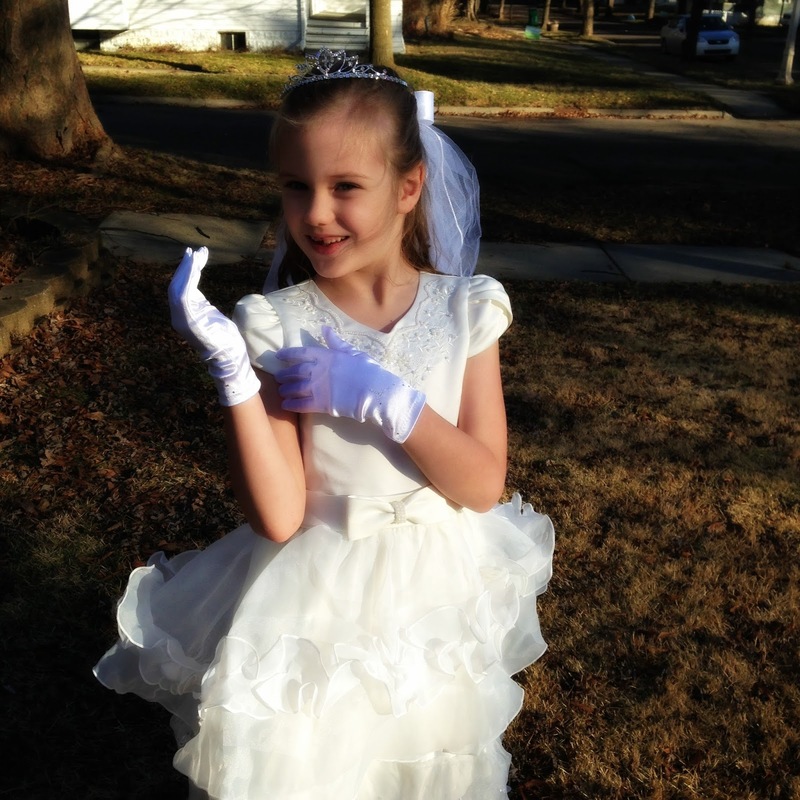 You have no idea how much your beautiful daughter reminds me of my favorite saint: St. Therese. I've spent most of my life studying the life of this great saint, and some of the things (I'm familiar with your blog) you post about Sadie astonishes me because St. Therese did the same things. It inspires me to see other young ladies applying the Little Way to their lives (I'm a late teen). I find that one can learn many lessons from little ones, mainly, to love God with a simple, joyful love that so delights the Most Sacred Hearts of Our Lord and Our Lady. God bless your family, and have a holy Lent. You and your family are in my prayers! I haven't even thought about the suit we will need for our 7 year old's First Communion in May. Should probably get working on that. So very delighted that Sadie;s long-awaited special day is drawing near! How sweet and innocent she is.